Hi Everyone. It’s Heather here. Let me begin by saying “I love to garden!” My children learn where food comes from, produce is affordable and organic, and most importantly, we eat delicious foods! Freshly harvested produce has superior flavor and vitamin content versus produce that has traveled hundreds of miles to reach your table. I’m always amazed at how long my home-grown produce lasts in our refrigerator compared to the produce we purchase at the grocery store. How long has that store produce been in storage? Hmm. As an additional way to promote healthy living, Balance Personal Training is proud to announce Organic Gardening Consulting Services! Services include: siting your garden, helping you decide the scope of the garden (I specialize in low-maintenance gardening), which plants to plant, assessing and amending your soil if needed, and basic gardening skills training. I can construct raised beds, make your garden blend in aesthetically with existing landscaping, and I can consult for organic landscaping techniques. A basic one hour consultation at your home, including site selection is $75. Please call Balance Personal Training 608-798-0081 to set up an appointment and for pricing on custom packages. 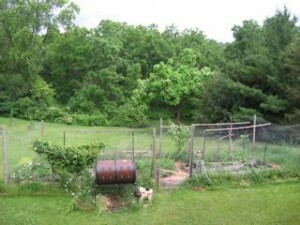 Below is my vegetable garden in our back yard. Over the years it has grown and grown. 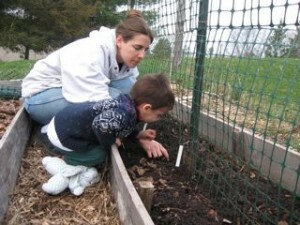 For beginning gardeners I recommend starting with a few raised beds. Even pots on a patio can be a perfect way to start turning that thumb green! Banana peels, orange rinds, egg shells, apple cores, onion skins, tea leaves, and most kitchen wastes inevitably find their way into our compost bin (see above pic: looks like a BBQ). Composting is a great way to reduce landfills, prevent erosion, regenerate poor soil, and have an organic garden. 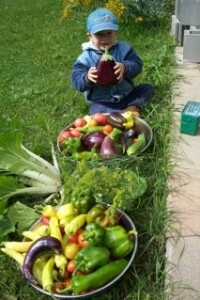 The varieties and types of produce you can grow are endless! Container gardening is a great way to get started. 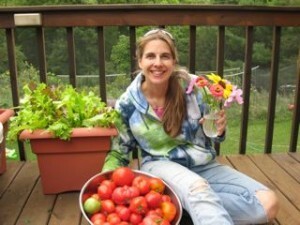 Behind the tomato harvest is a pot of lettuce – grown right on the deck!